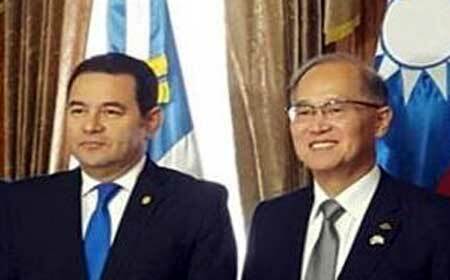 At the same time, the Government of Guatemala had been courting Taiwan for a mega-financing package for a very important highway. Since 2016, it had been reported in the Guatemalan press that that country’s president, Jimmy Morales, had been lobbying for financing for the Jacobo Árbenz four-lane highway (CA-9 Norte), and reports carried late last month confirmed that the financing had been approved. The news hit the local press after the recent visit of Taiwan’s Foreign Minister, Dr. David Lee, to Belize. On that occasion, it was announced that the diplomatic allies (Belize and Taiwan) had signed a US$60 cooperation agreement which includes US$20 mil in grant aid and US$40 mil in loan financing stretched over a 4-year period. Back in Taiwan, it had been construed as a resurrection of that country’s “dollar diplomacy” by providing money for an unspecified purpose. Focus Taiwan, a news source in Taiwan, in a July 31 article, referenced the Belize agreement and quoted Presidential Office spokesman Sidney Lin as saying that the government routinely provides foreign aid, and all foreign cooperation programs are carried out in a rigid, transparent and open manner in accordance with the International Cooperation and Development Act, based on allies’ economic development needs. However, the article did not mention the recently announced US$600 million arrangement between Taiwan and Guatemala, reported by multiple news sources in Guatemala. Guatemala’s president, Jimmy Morales is quoted as saying that the project is “the greatest work in history…” adding that it was conceived in 1859 as part of the Aycinena-Wyke treaty (the 1859 Boundary Treaty between Guatemala and Britain). He said that 158 years later, it is up to his administration to bring the plan to fruition. Guatemala has unilaterally renounced the 1859 treaty claiming a breach by Britain for failure to build the road, and although the treaty said that the borders of Belize (then British Honduras) specified in the document existed prior to January 1, 1850, Guatemala has insisted on wanting to claim at least half of Belize as its original territory. It wants to have the matter adjudicated at the International Court of Justice (ICJ). Despite the funding from Taiwan for the road project, Guatemala has reinforced its plan to pursue the matter at the ICJ, and last week reaffirmed its intent to move ahead with the required national referendum. According to Guatemala’s president, the funding from Taiwan is for a four-lane highway to Puerto Barrios. The project cost is US$680 million: Taiwan will donate US$250 million and lend Guatemala US$350 million. The vastly concessionary loan is for a 30-year term. The Government of Guatemala would find the rest of the funds needed for the project, the president had reportedly said. 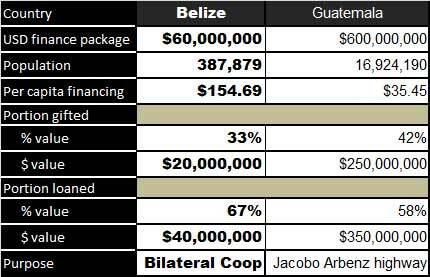 Although the funding which Taiwan is giving to Guatemala is 10 times more than what it is providing to Belize, Belize is getting almost 5 times more than Guatemala, on a per capita basis. Officials from the Belize Ministry of Foreign Affairs answered questions from journalists concerning the funding for the highway at a press briefing on Friday, putting the emphasis on trade prospects. Ambassador Rosado said that to what extent Belize will use it as an opportunity or a threat is left up to us. Belize enjoyed diplomatic ties with China between 1987 and 1989, but after it adopted a two-China policy (acknowledging China and Taiwan as separate states and establishing diplomatic ties with Taiwan), China suspended relations. 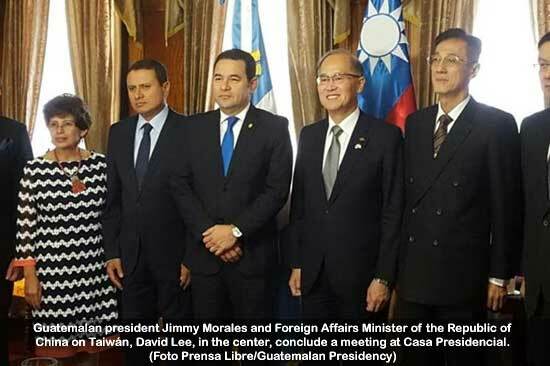 In January this year, President Tsai Ing-wen, installed last May as Taiwan’s president (the first woman to hold that office), visited Guatemala on a bid to strengthen ties with that country. On that occasion, talks also advanced on the US$600 million funding package. The parties have also pledged cooperation in health and tourism.